The Microsoft MCSA is, as yet, a "young" certification. Nonetheless, certcities.com has predicted it will be "the hottest certification" this year. Microsoft suggests that it is "appropriate for people who administer, support, and troubleshoot information systems that incorporate Microsoft Windows 2000." The Web page that covers this exam gives details. This exam is a core requirement for the MCSA. You'll need to know IIS, the proper way to share folders, files, printers and Web services, and file systems like NTFS, EFS and DFS. Security and permissions play a big part in all of this. Network Infrastructure can be summed up with five letters split by a slash: "TCP/IP". Details include a lot more letters: DNS, DHCP, PTR, CNAME, and a dash of WINS. On the lowercase side be ready for questions on ping, tracert, ipconfig, netdiag and nbtstat. This big task is broken up into smaller ones for your convenience: install and configure server and client computer hardware, troubleshoot starting servers and client computers, monitor and troubleshoot server health and performance, install and manage Windows 2000 updates - to name but a few. Not everybody gets to build an Active Directory. More people will be needed to maintain one. They should be prepared to do anything from creating and configuring user and computer accounts for new and existing users to implementing and managing security policies by using Group Policy. Many companies are using Remote Access tools to link their mobile workers to headquarters or share an Internet connection at headquarters. You mission is to make it all work, keep it working and make sure that it's secure. The devil is in the details and the details are in the questions. 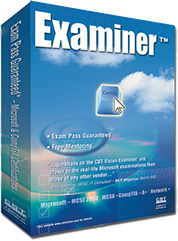 Our product has 182 questions -more than 3 times the amount on the actual exam - so you're going to be prepared to pass 70- 218 with little or no trouble... if you buy Examiner™ today. Start preparing to pass the exam and make an impression. For a list of all the topics you need to know to pass this exam you can visit Microsoft's official web page for the 70-218 exam.